Extend from $.fn.window.defaults. Override defaults with $.fn.dialog.defaults. The dialog is a special type of window, which can has a toolbar on top and a button bar on bottom. The dialog has only one close tool display on top right of header by default. Users can configure dialog behaviors to display other tools such as collapsible, minimizable, maximizable tool, etc. Create dialog via markup from an existing DOM node. The example below shows a modal dialog with resizable feature. The properties extend from window, below is the overridden properties for dialog. 2) a selector that indicating the toolbar. 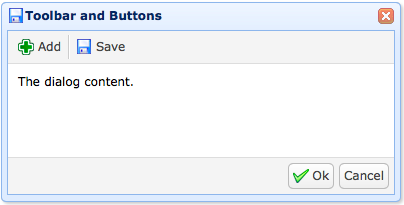 1) an array, each button options is same as linkbutton. 2) a selector that indicating the button bar. The events extend from window. The methods extend from window, below is the added methods for dialog. dialog none Return the outer dialog object.